My DB subscription expires this month and I need to renew. Unfortunately with the new Garmin web site I can't seem to figure out how to buy what I want. I can't seem to figure out how to purchase them. I can find the GTN 650 update but I can only seem to find the US Database bundle as part of a more expensive GTN 650 package. Add the bundle to the cart, then add the yearly Nav only db for the GTN to the cart. View the cart and then remove the extra bundled option you don't want. Not the most user friendly way to do it, but it worked. I recently called Garmin to ask which databases to buy, I have a G3x touch/GTN 625 system. I told them I want to use the external GTN 625 GPS 90% of the time. If I use the GTN 625 I was told I would need the GTN bundle if I want obstacles, safetaxi and other features in the 625. 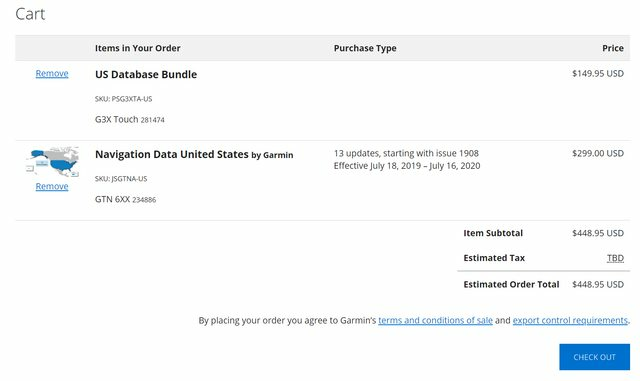 Garmin said I needed to purchased both the G3x and GTN bundles for $149 and $499 respectively. Did I get the correct information? If you fly a GTN 625 flight plan will you have obstacle, safetaxi and other databases using the external GPS if you don't buy the GTN Bundle? That depends on where you want the information to display. If you use the GTN 90% of the time and you want terrain, obstacles, etc on the GTN 625 screen then you need the GTN bundle. Similar to the above posts I only purchase the Garmin Nav data for the GTN-650 for legal IFR navigation. The $149 bundle for the G3X Touch already provides me terrain, obstacles, etc on the G3X screens. With the large G3X screens I don't personally have a need to see that same information on the GTN screen. Yep, I've done what Andy said for the last three plus years. I enter/edit flight plans on the GTN, but I navigate and do everything else off of the G3X Touch screens. synchronous timing. I just went thru this this morning and discovered the "solution" that Brantel mentioned. ouch. FYI: I received an email from G3Xpert and they are aware of the complexity. They informed me the web team is working to improve the process. Last edited by humptybump : 10-09-2018 at 08:11 AM. Thanks for the clarification on the G3x bundle and how it displays in the "external GPS" mode while using the GTN 6XX. I will call Garmin and modify my GTN subscription and save $200. I assume data alerts in the G3x will be active when navigating a flight plan in the GTN.